I am just quickly sharing two more Urban Sketches. 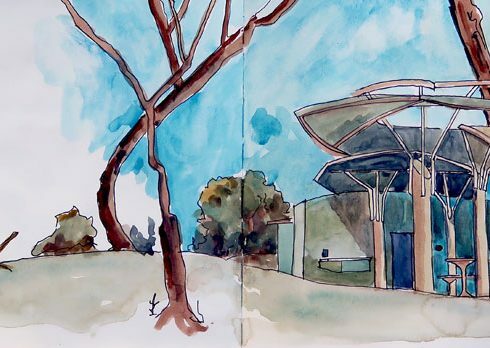 Yesterday was the regular meeting of the Urban Sketchers Canberra Group. We all gathered together at the Australian National Botanic Gardens to sketch for the morning. The gardens are lovely I always enjoy them. Below is my effort for the morning. As I was sketching a couple came up to me and told me how they got married there. Last weekend Government House was open to the public. So we like thousands others went to look at the house and of course do some sketching. Both images are linked to larger versions, so click on them to see them. I hope to do a little more sketching before I leave on our trip. Both sketches are done in a Stillman and Birn Alpha series landscape (9 x 6, 22.9 cm x 15.2 cm) sketchbook 150 gsm white medium grain surface paper using a Lamy pen loaded with De Atramentis Document Ink and watercolour paints. The Urban Sketchers Canberra Group meet regularly on the second Sunday of the month, sketch, then coffee or lunch together. It is always a day I enjoy and look forward to as many of the people who attend have become firm friends. We have informal meet up days too but the monthly meeting is always good. Anyway if you live locally and want to know more about it check out the Urban Sketchers Canberra group facebook page. Everyone of all skill levels are encouraged to come along. These are fab! I particularly love the palette and the tones on Government House. These are completely intriguing, Sharon! You have quite a talent, for sure! Enjoy!